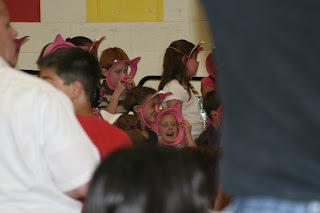 Aubrey and the entire 1st Grade performed "The 3 Piggy Opera" for us parents last night. They were so cute!!! The singing and acting was adorable. Aubrey was nervous to be up there. 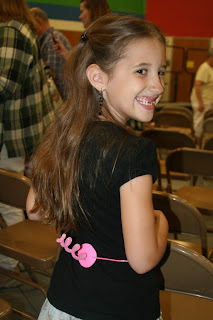 She doesn't like to get up in front of people at all, but she did it and she was great. They were 100 of the cutest lil piggies you have ever seen! And I'll finish this post off with a little piggy booty shake. . .
How sweet Holly! Your kids get to do the coolest things! So fun. My snout is even smiling. How cute! I bet it was lots of fun to watch her perform. Love the curly tail. I was a bit worried judging by the picture alone. 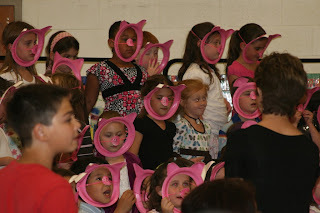 I feared public school was doing a play already about evil, capitalistic pigs. The 3 piggy opera is the best! 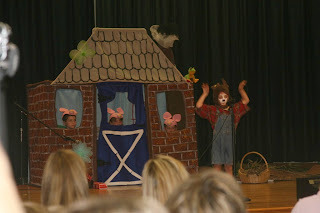 Jerald did this play in Kindergarten and it is so cute!! 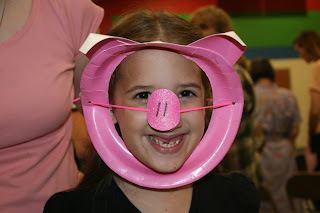 She makes a cute piggy! Those are the cutest masks. What a cute opera. This is too cute I love these kind of programs wish we could have seen it but I'm sure you did a great job Aubrey your a cute lil piggy for sure. I LOVE kids school performances! There really isn't anything much cuter than that!